Warp faced plain weave with warp substitution technique is a nice way to learn pick-up as a warm up to doing one-weft double weave. You have a lot of freedom to create striking patterns on the upper surface of your fabric. It is basically warped with pairs of threads…one in each of two colors.. and woven as plain weave simply substituting one color for the other as required by the pattern. The only drawback to this technique is the fact that the back of your textiles will have long floats. I find this technique suitable for textiles which have only one face showing, such as, wall hangings, belts, table runners etc. If you used it for a bag, it would be a good idea to line the bag so your fingers won’t get caught on the floats when you dive in to get something. EDIT: Tracy Hudson, who currently lives in Doha Qatar, showed us a textile from Oman on which the weavers have used a fine supplementary weft to secure the long warp floats on the back of the textile. This is not a traditional practice and Tracy suspects that the weavers have been encouraged to do this in order to make the textiles more appealing to buyers. The technique used to secure the floats is detailed in this blog post. Bedouin weavers in the Middle East use this technique to decorate the large pieces of fabric which divide the space within their tents. 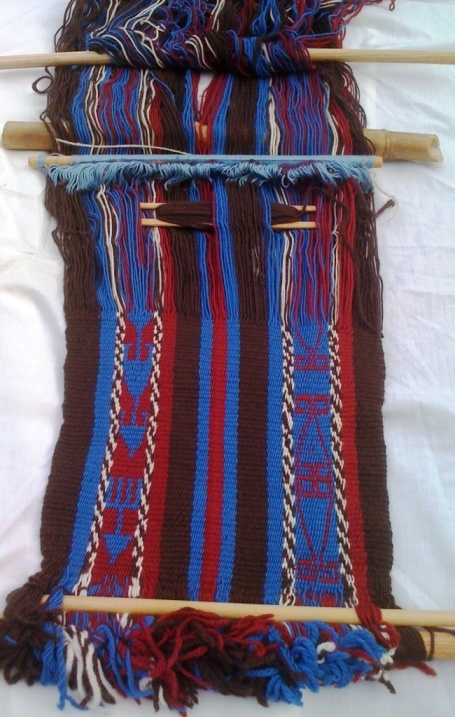 I wove the piece above using the colors, motifs and technique found on tent dividers used by the Bedouin people. I am using it as a wall hanging so the floats won’t show. 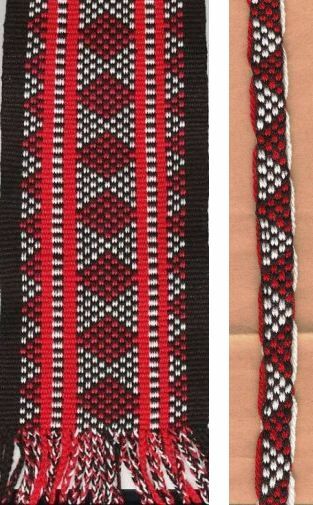 The black and white designs are woven in the warp substitution technique. The floats bother me less when the thread I am using is fine. This thread is number 10 crochet cotton (35wpi). You can see the floats on the reverse in the image on the right. I made a sample band for this tutorial with a 24 wpi thread and the floats are quite thick on the back. This size thread would be okay for a wall hanging but I don’t think it would make a good table runner because of the bulk of the floats in the design area. Above you can see the sample with a tiny version of one of the Bedouin designs. And there are the long floats on the back which I have “tied down” by weaving a couple of horizontal white bars before proceeding to the next motif. 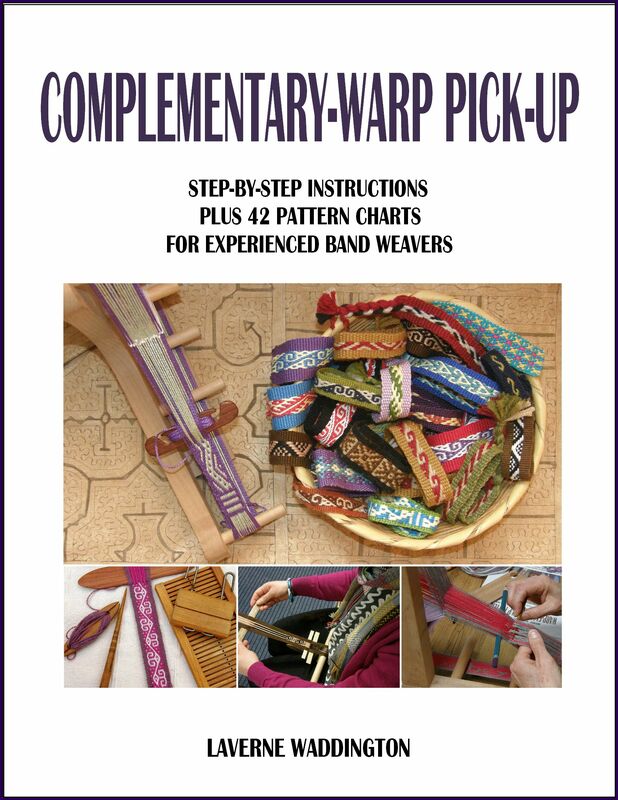 In any case, if you have been longing to try the one-weft double weave technique, the warp substitution method will give you many of skills required to get started without having to worry about the extra steps and manipulations required to weave the two layers of the double weave. I recommend this as a warm-up to double weave. My sample band has eight ends in its border: two black, four white and two black. To achieve this, I wound one revolution of black, followed by two of white and one more of black around the two stakes of my warping board. In the upper of the two diagrams below you can see what I call one revolution of warp on my warping board which creates two ends. The lower diagram shows how to warp the design area. I warped black and white for my design area. 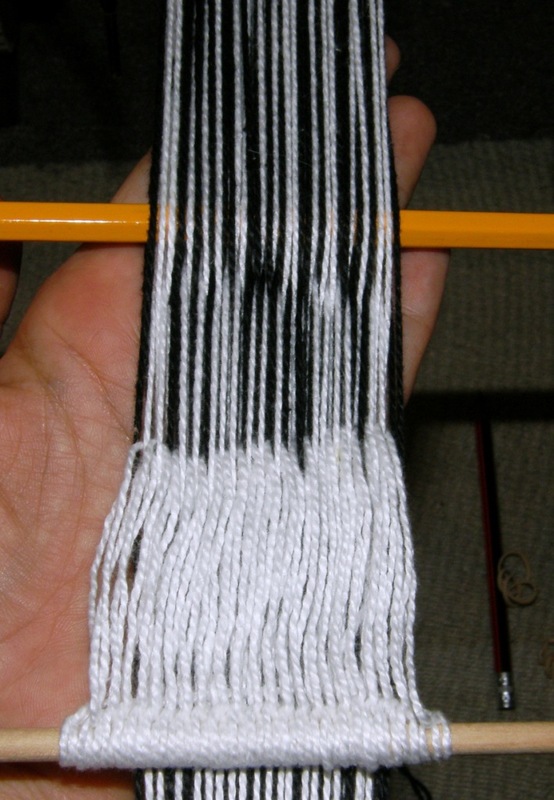 Both the black and white yarns need to be tied to the last border yarn on the warping board and wound together. There are twenty-eight doubled ends in the design area and so I made fourteen revolutions on the stakes with the two colors together. One revolution can be seen above. I finished by repeating the eight ends for the border. 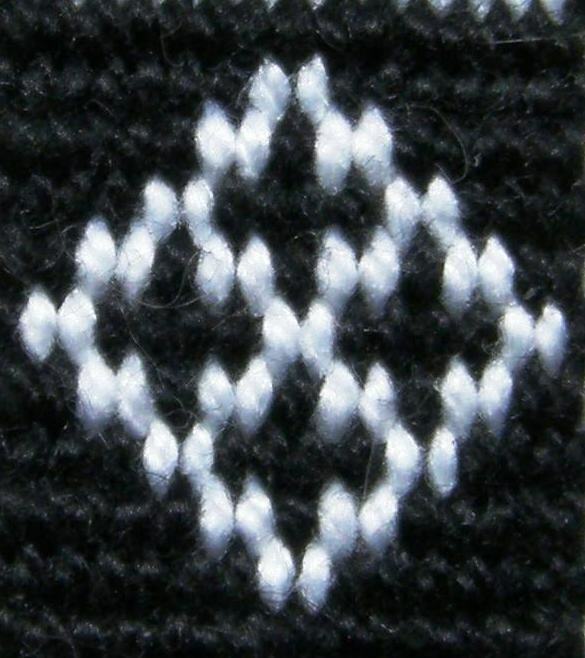 Above left you can see the cross with the eight ends of border warps on the right and then the doubled ends for the design area. The warps that are passing over the red stick will go into string heddles (a tutorial for making string heddles is here). The yellow stick will stay where it is and be used as a shed rod. Above right you can see that I have made my string heddles and can now remove the red stick. And here on the left are the string heddles and shed rod in place. Make sure you tie a cord from end to end on the shed rod so that it can’t fall out of the shed! The shed rod as it is will tend to slip about a lot and be a nuisance and so you can secure it if you like by following the instructions here. You can see that I started weaving my sample band with a few rows of plain black just to get started and establish the width. In the pictures below I am about to weave a row of plain black before starting my new design. I have opened the shed (when you are starting, it doesn’t matter which shed) and placed my left hand within. I am going to select the warps I need for this shed with my right hand. The warps which I don’t need will be dropped. First I pass the four border warps, one black, two white and one black, to my right hand. Now I have reached the design area where the warps are in pairs. In each pair there is one white thread and one black. From each pair I select the black thread and pass it to my right hand and allow its white partner to drop below. Above left you can see the black warp which I have selected and passed to my right hand. Its white partner has been dropped. Above right, you can see that I am half way across the row now with a bunch of black warps in my right hand. 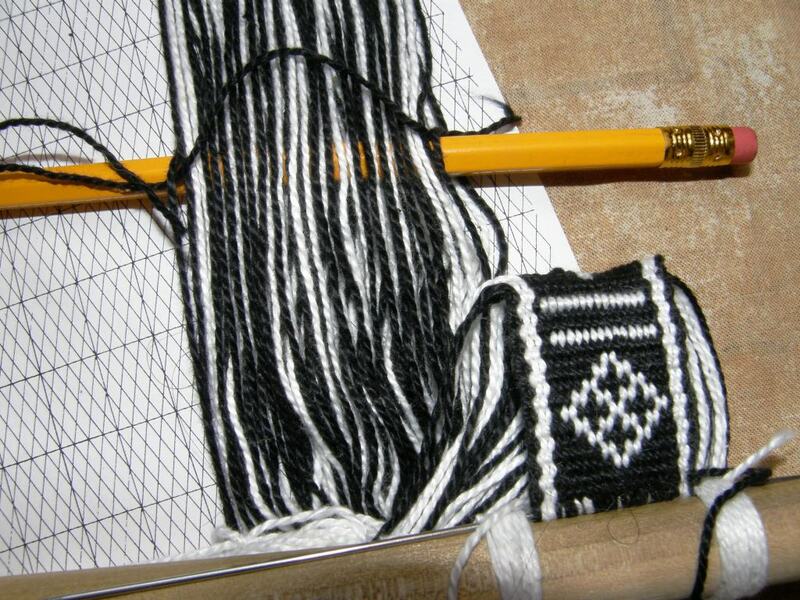 All the black warps have been selected and I have included the group of four border warps at each end. This is my first shed and I can now pass the weft. I just have my hand in the shed for this photo but normally I would prop the shed open with a beater and then pass the weft. 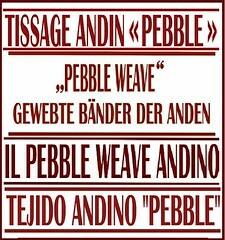 Always remember to beat before passing the weft. (Of course, there is nothing to beat for your very first weft pass). Draw the warps close together so that they completely cover the weft. Remember that this is a warp faced weave. Notice the difference in width between the woven band and the warps as they pass over the shed rod. Make sure you adjust the width of your band correctly in the first two weft passes. Don’t weave more than three rows of black to get started. Remember that when you are weaving black on the upper face, you are creating white floats on the back. If you weave a very large area of solid black you will have very long floats on the back and your white warps will also get slack. 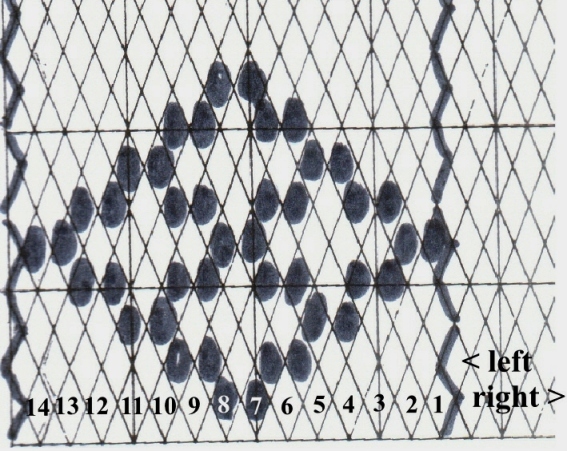 I use a diamond charting paper to chart these designs as the diamonds represent very well the staggered arrangement of the warps on the surface of the textile. The chart only shows the design area of your band, the borders have not been included. Each diamond represents a single warp that you will select in the design area. You can see that there are fourteen diamonds numbered above showing one warp that has been selected from each of the fourteen pairs of warps that you have in each shed. The first thing you need to do is check the alignment of your pairs in their sheds. The pattern starts in the shed in which your warps are aligned to the right. Check in which of your two sheds you have your outermost right warp. You will need to start your pattern in this shed. Counting from right to left, the first six warps numbered on the chart will be black for the background. So from your first six pairs of warps you will select the black one and drop the white. Then you will select the white and drop the black from the next two pairs to form the start of your white design. 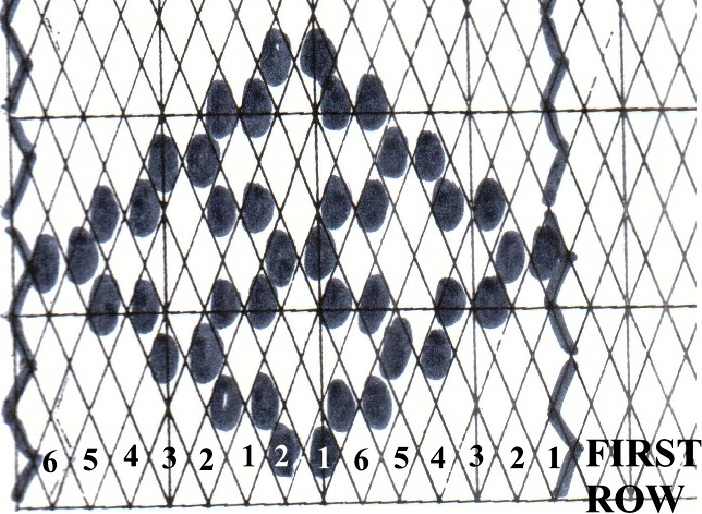 Finish by selecting once again the black warp from each of the six following pairs. 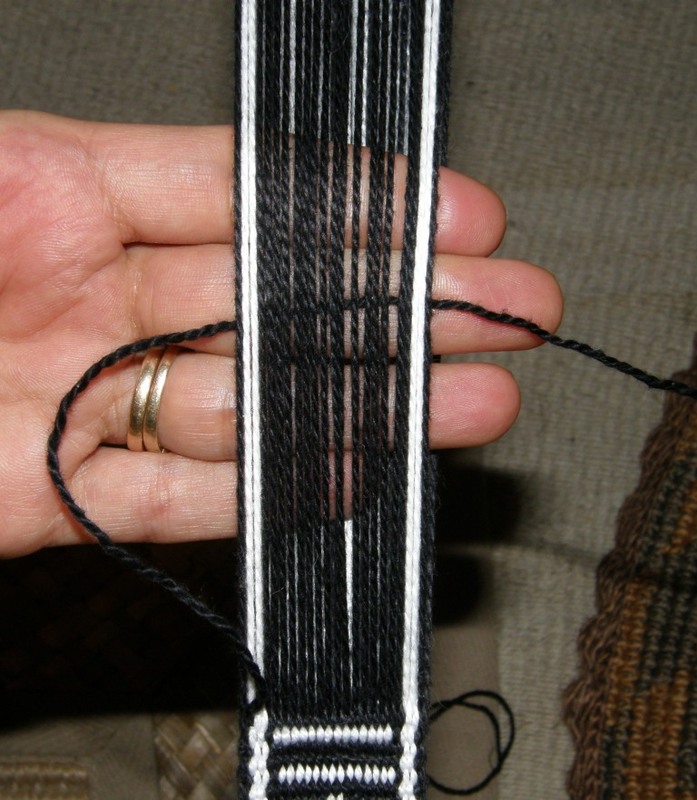 Include the border warps at each end, beat and pass the weft. Above left I have selected the first six black warps and am now selecting the white warp from pair number seven and saving it in my right hand. Its black partner which is sitting on the fingers of my left hand will be dropped. Above right you can see the completion of the first row. I will place the beater within this shed, beat and pass the weft. Now it is just a matter of reading the chart and continuing. Open the other shed and pass the borders to your right hand and proceed to select the first four black warps, then two whites. one black, two whites and finally five blacks. Add the border warps and you have completed your next design shed. 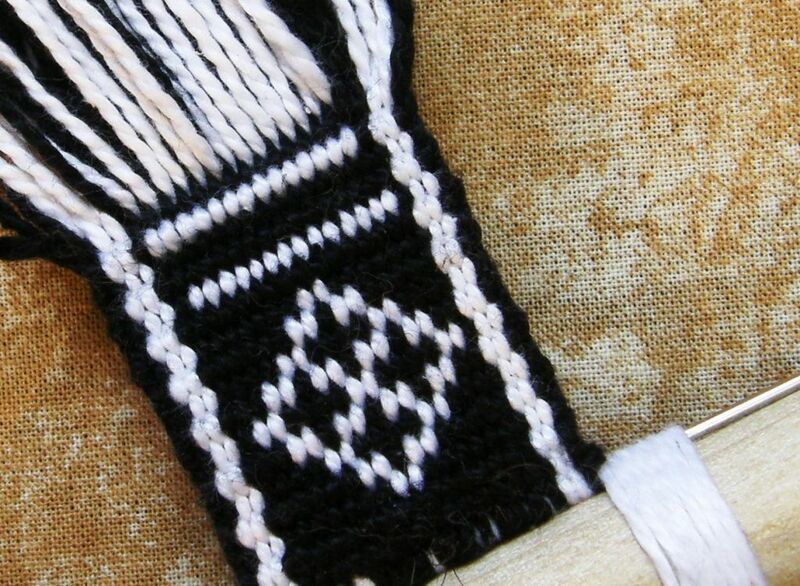 After finishing a motif, I recommend weaving either two consecutive rows of all white warps or a row of white, two rows of black and another row of white, as I have done, in order to “tie down” the white floats that have formed on the back. The motif that I have presented here is a small version of one of the Bedouin designs. 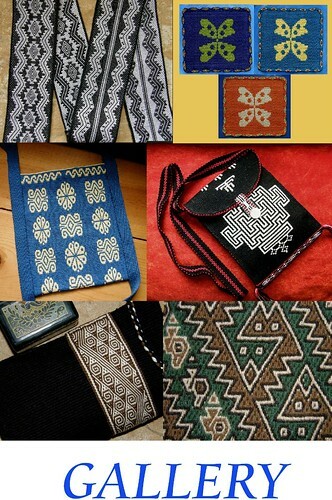 You can take a look at the other Bedouin pattern charts to get ideas for other motifs or chart your own. 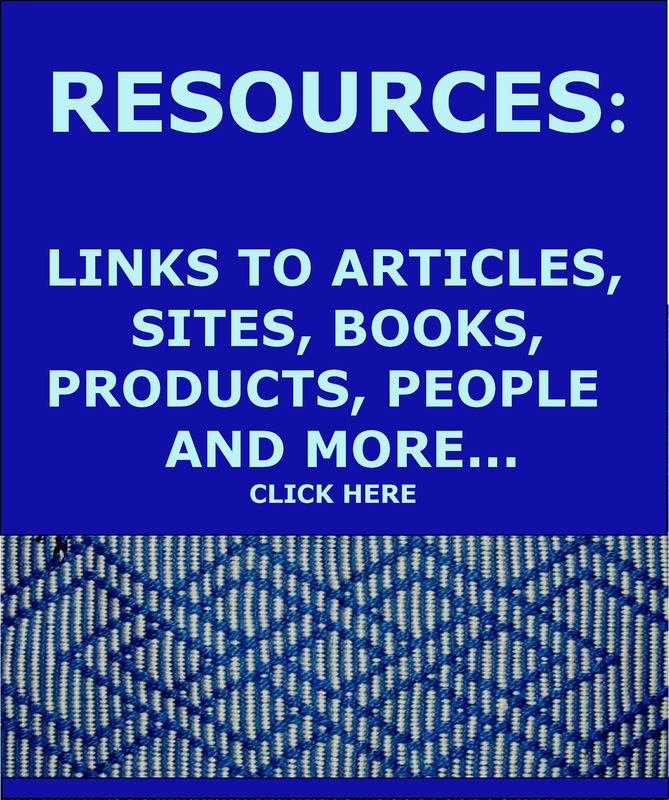 Download the diamond paper for charting here. Because you are working with pairs in this technique rather than single threads each separated into their own sheds, there can be a tendency for the warps to spiral. A certain amount of spiraling will inevitably occur and is harmless unless it is extreme. Try to always handle the warps in your pairs in the same order, that is, try to always keep the black on the left and the white on the right or vice versa. This means that if you need a black, you will pass it first to your right hand and then drop the white. If you need to select a white you will drop the black first and then pass the white to your right hand. Consistency is the key. Keep an eye on your warps up beyond the heddle shed and try to prevent excessive spiraling. You may find that your white warps get a bit slack as you proceed. If this happens, you can put a dowel or other thin stick under all the white warps up at your far loom bar and tie the dowel to the bar. This will help take up the slack. I hope you enjoy this technique and that it will help you take the next step toward one-weft double weave. 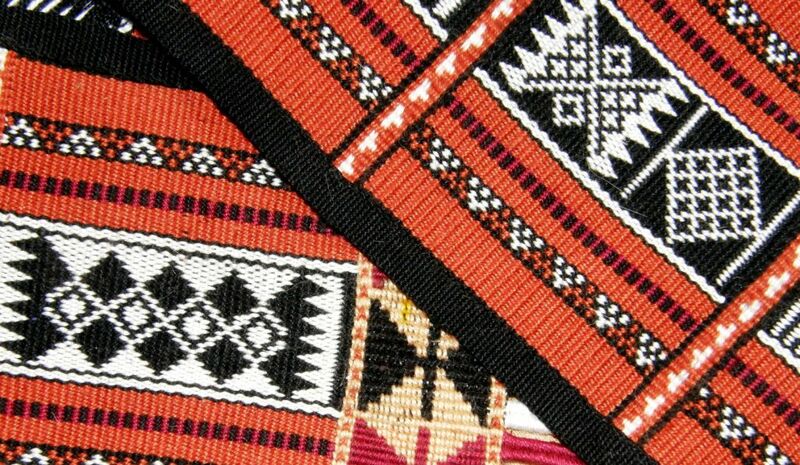 At left you can see the al’ouerjan pattern (the kind of checkerboard pattern) that is very typical in Bedouin weavings. My attempt at it at left actually has a warping error…there is one black warp missing which would have divided the design into three columns. This is also warp substitution technique with doubled threads in only one shed. Warp one shed with all black threads and the other with doubled red and white. You will weave one shed black and then select either red or white in the other. My design has columns of two warps separated by black. Helena in Brazil has experimented with this design using the instructions in this article. Joy Totah Hilden’s book Bedouin Weaving of Saudi Arabia and its Neighbours also shows the threading for this design. This book is fabulous but is not a “how-to” if that is what you are looking for. 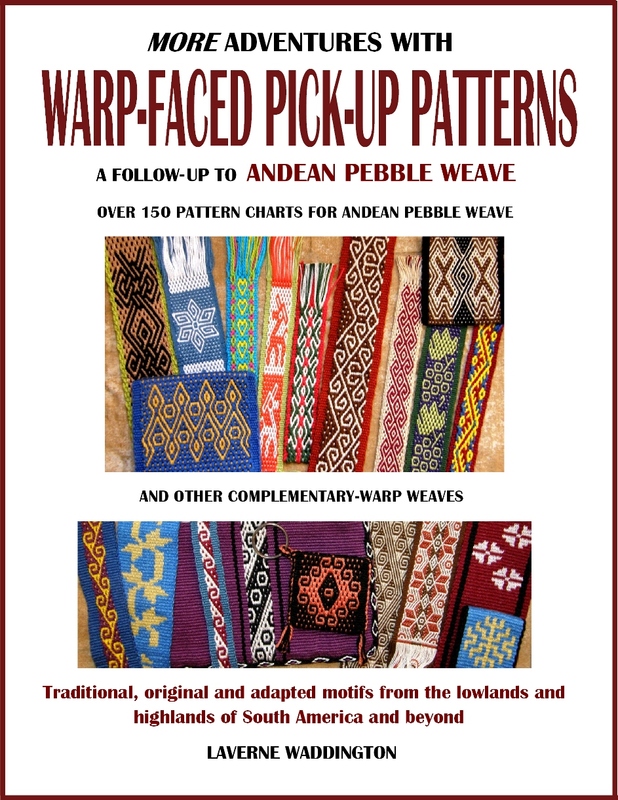 I have put together a tutorial showing how to warp for the al’ouerjan patterns here. My friend Lisa wove a narrow band in this technique with a design called “running dog” on her Easy Weaver loom in the warp substitution technique. The jajim is based on Uzbek, Kyrgyz and Persian designs. I purchased wool and then respun it to get enough twist for use with the backstrap loom which is functionally the same thing as the traditional horizontal ground loom except that it is body tensioned instead of being staked to the ground. I am lucky to have had the opportunity to see a tent band in this technique as well as some actual jajims which were at a Persian rug shop in South Carolina. I learned a lot with both the test straps and the larger piece. I realized only after I had begun that I had mixed designs from two different groups and that I had not purchased enough weft and so I am stalled out on the project trying to decide how to proceed. I just love the red and blue together! OMG Thank you! I have *always* wanted to know how this was done. I can’t wait to give it a try!!! You have just made a difference in someone’s life, mine. THANKS AGAIN!!! Hi Jennie, thanks for the link. It’s so lovely to see you enjoying the pebble weave book so much and getting creative with the patterns. I should tell you, however, that warp substitution and complementary warp are two entirely different techniques..one is not AKA the other…just a terminology thing. Happy weaving. I would love to see whatever else you make. Is this also similar to the complimentary warp substitution? It seems the only difference is that in this technique, each shed has both colors, while in the complimentary technique, each shed has only one color. Is this correct? If so, why wouldn’t there be floats with the complimentary as there are with this technique? In comp warp the warp pairs with which you are working comprise one thread on each side of the cross. One thread is used in the upper face and the other in the lower face. You are the swapping places of an upper thread and a lower one. 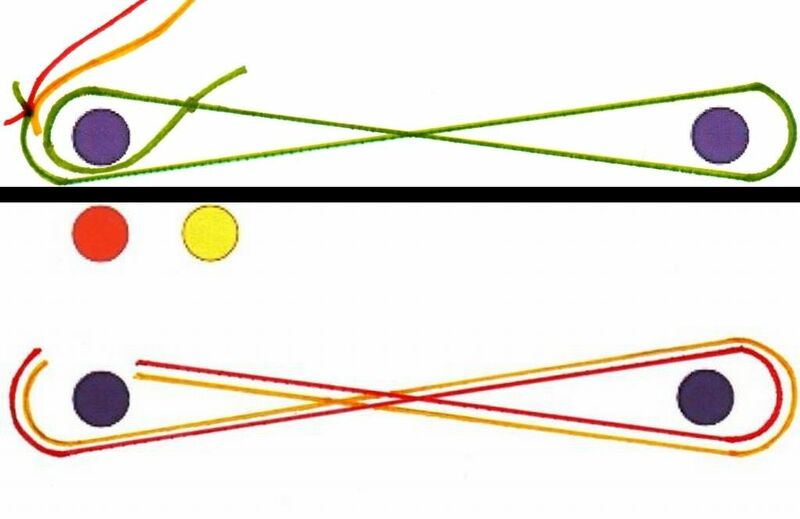 In warp sub, the pairs are both on the same side of the cross as if they were a doubled thread acting as one. They are both upper threads. One gets selected and used and the other is not used at all and so just floats underneath. There is no swapping of threads between the upper and lower layers. It’s like you had split one two-ply thread and only used one of the strands, allowing the other strand to just fall underneath unused.